Keep your gardens alive with color through the winter by attracting songbirds to your yard. Feeding birds throughout the winter not only benefits the birds, but is a great hobby for gardeners to keep us active and engaged with the outdoors. Heavy winter snow events can cover up much of bird’s natural food sources, forcing them to seek out what humans may have left out for them. There is nothing quite like seeing a bright red Cardinal against a snowy backdrop. When feeding birds, you can try to be specific as to which birds you would like to attract, or very simply provide a mixed seed which will attract an array of birds. Different feeders are attractive to some types of birds, while discouraging others, and specific foods and seeds will attract some birds and not others. Hard wire mesh feeders are attractive, often painted with bright colors and will attract many of your smaller, clinging birds like Chickadees, Nuthatches and Tufted Titmice. These are great for larger seed blends like black oil sunflower seeds and safflower seeds. They often stay stocked for a while since the birds need to pull seeds out individually. They also tend to leave the ground below much cleaner. A platform feeder is great for any bird, but especially attractive to the larger birds: Blue Jays, Mourning Doves and Flickers. You will often find Dark-Eyed Juncos using these types of feeders as well. 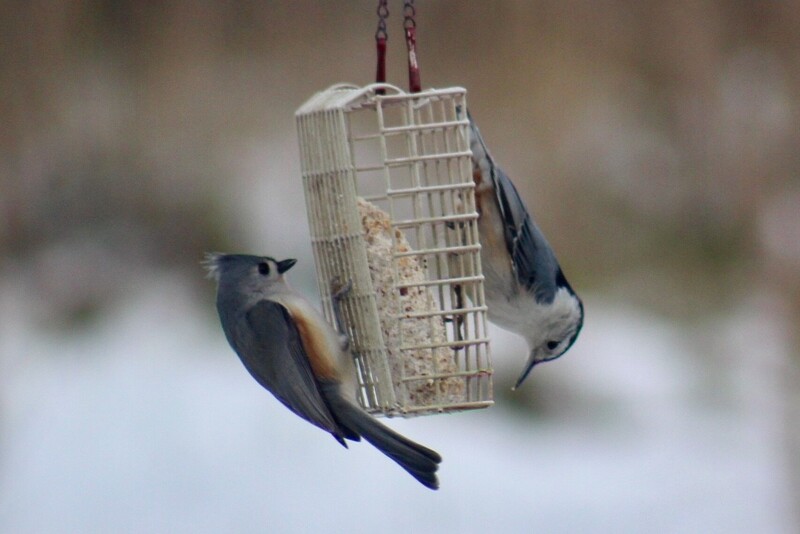 Any type of seed and nut mix will work well on these types of feeders. It’s fun to watch the individual personalities as the different species interact in the open space. Hopper-type feeders are great for keeping seed fresh and protected from the elements. 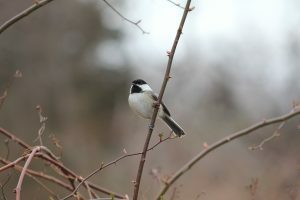 These are a great option if you don’t intend to go out to fill the feeders often, as they can hold quite a bit of food. 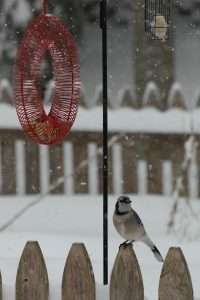 A popular food source for birds in winter is to provide suet. 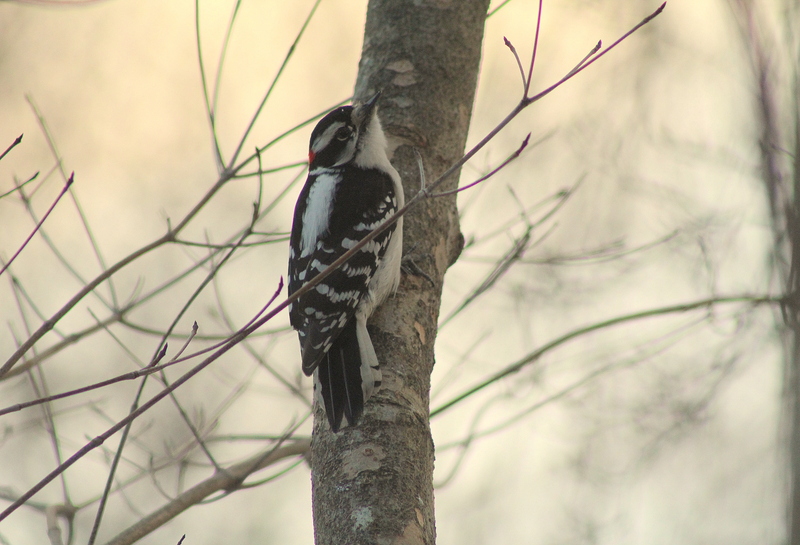 Suet is a high-energy food source that will attract woodpeckers. Peanut butter is also a great fatty food source. You can search for fun DIY feeder projects using peanut butter and seed that will be sure to attract lots of different hungry visitors. Ready for some real entertainment? Get yourself a peanut wreath. It is so much fun to watch the blue jays and squirrels bickering with each other trying to remove the peanuts from the spiral of wire. 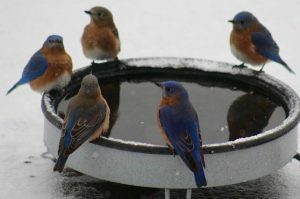 Prolonged freezing temperatures can make water sources scarce, so providing fresh water is a surefire way to attract birds and other wildlife to the yard. Often times you’ll attract a more diverse set of species with water than you would with seed. You can provide a fresh water source all winter long if you purchase a water de-icer or an ice-free birdbath. These contraptions do not heat the water, but simply keep the water from freezing – typically down to 20 degrees Fahrenheit. Most of the quality re-icers on the market need to be plugged in and generally cost $1-2 per month to run, depending on how cold the weather is. When you feed birds outside, you may quickly find that the larger predatory birds are just as hungry as the songbirds. Hawks will often perch in high trees near feeders, waiting for an unsuspecting dove. For this reason, it may be a good idea to hang feeders near shrubs or other brush material so the birds will have quick access to shelter if needed. In the same way, be aware that feral cats have a way of staking out backyard birdfeeders. Sometimes you do not have to invest any money at all to attract birds to your yard throughout the winter. You can simply provide habitat for them by minimizing your fall cleanup. Leaving sticks and other small debris lying about for wildlife to pick up and use as needed. Or pile up larger branches and debris in a discrete corner of the yard where wildlife can use it as shelter through the winter Allow spent flower heads to stand throughout the winter for finches to pick through. Consider leaving the dried stalks of ornamental grasses to stand all winter to provide habitat and shelter for wildlife and insects. In the spring, birds will often take pieces of the grasses to assemble their nests. Following some of these tips will ensure that looking out of your window in the winter will not just make you long for springtime, but appreciate the beauty that each season brings us. This entry was posted in Uncategorized on January 23, 2018 by dmc72. 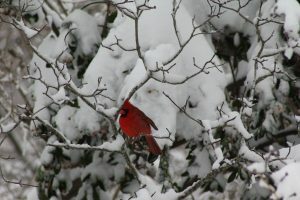 Love the winter bird scene! This was a lovely tribute with some good info that I will take to heart. Can’t wait to try some of the mesh feeders and thwart the squirrels (somewhat).